My career work was in education for 34 years and, most of those years where spent coaching boys basketball.. My educational background began with undergrad work at Hiram College, and was completed by my receiving my Master Degree at Kent State, Kent, Ohio. Upon my retirement, I came to Florida with the intent of concentrating on golf and fishing. That all changed when Brian Gilles approached me as asked if I knew about a game called pickleball. I said yes because I had my students play it sometimes during my physical education classes. 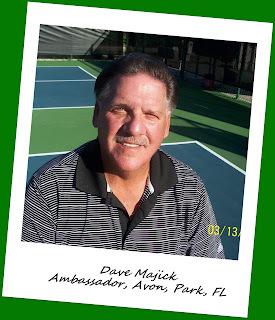 We decided it was time to introduce pickleball to Highlands Ridge here in Sebring, Fl. With the normal obstacles of tennis courts being taped, etc., behind us, we began to grow to our present 45 members who play almost every day. Once established I decided it was time to expand the pickleball experience beyond just USAPA tournaments and Senior games. We wanted, not just single and doubles games, but we wanted one community versus another community, a concept we all grew up with during the days of our town's football team versus another arch rival. Hence, each community team (South Central Florida Pickleball League) sends it eight best players, no age brackets, no skill determination. Just bring your eight best! It is a league made up of five communities and we have a great time competing in this manner with a shootout tournament deciding the league champion. Through our two local papers, we gained great publicity for our league and the sport of Pickelball. Coupled with my involvement in Sebring, is my pickleball involement in Northeast Ohio. We started pickleball in Cortland, Ohio and have four courts in our city park where we have nightly play among 20 to 30 players. We are also developing the team competition concept for other communities from Cleveland to Akron to Youngstown, Ohio and Western Pennslyvania. My other pickleball adventure is the development of a device I call, "The Pic", which I am marketing with the help of Reagan Marking and Design, Grand Rapids, MI. "The Pic" is a device that allows one to hit three doz. balls, and pick them up quickly, without straining ones back. It makes practicing a reality that was out of the question before "The Pic" came along.